Bollin Rigging Co supplies a number of products that are ideal for use in the garden, ranging from stainless steel wire trellis and training systems to traditional manila ropes or longer lasting synthetic hemp ropes ideal for rose swags, decking balustrades, and handrails. Our stainless steel plant trellis is easy to fit, very strong and has an almost indefinite life - important when you have a large plants growing on it. 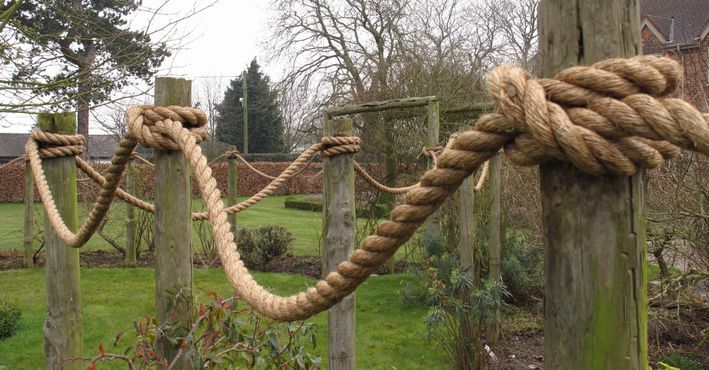 Our traditional Manila rope is ideal for the garden being strong and rot resistant. In time, the rope will weather to give a very attractive finish. Stronger and longer lasting than sisal rope or coir rope and cheaper than its synthetic alternative, manila is the best choice for your garden. The downside is that Manila rope shrinks in use and will eventually rot when used outside. Synthetic Hemp rope is more expensive but stronger, longer lasting and does not shrink. In addition to the above, we supply a full range of marine related hardware suitable for use in the garden. From chain to galvanized eyes and wires we stock a large range of interesting gear! All the above available from stock for delivery via 24 hour courier. If you have any queries regarding any of the above products, please do not hesitate to get in touch via our contact page.